The original developer of one of the investing strategies in “Muscular Portfolios” has decided to tweak one of the inputs to his formula. Should this change also be made in the Mama Bear Portfolio? This question gives us an excellent way to confirm how strategies should be tested and implemented. Your comments are welcomed. See Newsletter #16. About 70% of US companies automatically enroll employees into 401(k)-type plans. More than 86% of these firms now direct people’s money by default into “target-date funds.” Now that they’ve taken over, the products expose investors to far too much risk of crashing, experts have found. A simpler formula, with much lower costs, produces greater returns with less risk. See Newsletter #15. Traders have tried for centuries to find a formula that will predict the direction of the market. The truth is that there are too many unknowns to reliably determine what any free market will do in the next one year. Despite that, it’s surprisingly easy to predict where the S&P 500 will be in the long term. See Newsletter #14. A new study reveals that the smallest stocks in the market can cost you as much as 8% when you buy and sell shares. That percentage is called the “bid-ask spread.” In the first of a new series of columns for MarketWatch.com, we show you how to avoid getting a haircut when you trade. See the details on small stock spreads at MarketWatch. There are 13.6 million tax-free college savings accounts in the US, and millions more in other countries — but most of the program administrators produce mediocre results. Fortunately, there are a few easy ways parents can get great gains out of a 529-type plan, with no fear of market crashes. See Newsletter #13. The book “Muscular Portfolios” contains 576 footnotes. To make the link destinations easy to enter, each one is supported by a Web address shortener such as bri.li/1000. The full destination of each short address is provided at our 1st edition notes page for your convenience. However, some Google Pixel phones don’t correctly redirect to the proper destination. There’s an easy workaround, as described in Newsletter #11. There are tricky features at the giant retailer Amazon — and many other booksellers — that skillful buyers know how to use to get the lowest prices on products. We reveal for you a few of the ways. 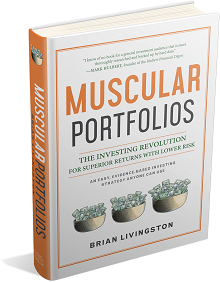 Even better, for only a short time, buyers who order the book “Muscular Portfolios” can use a special promo code to get extra percentage points knocked off the already-discounted price. For more information, see our newsletter update. Interest rates are rising, but brokerage firms are taking their sweet time giving you higher yields in their “cash sweep accounts.” If you’re holding some cash, you might be receiving from your brokerage as little as one-tenth of the interest you could be getting from cash-like exchange-traded funds. There are three kinds of ETFs that can pump up your interest far above the rates brokerages are paying you in their sweep accounts. For more information, see Newsletter #10. The Muscular Portfolios Newsletter has been developed in a series of beta-test editions over the past 2½ years. After extensive trials, the newsletter begins regular monthly publication with the launch of Issue #10 on Sept. 11, 2018. Issues after that date will be sent to subscribers in the first week of each month. To receive your subscription, please sign up using the newsletter form in the right-hand column. IMPORTANT: (1) The subscriber list is not rented out, (2) you will receive no “junk” emails, just the Muscular Portfolios updates you expect, and (3) you’re free to unsubscribe at any time.